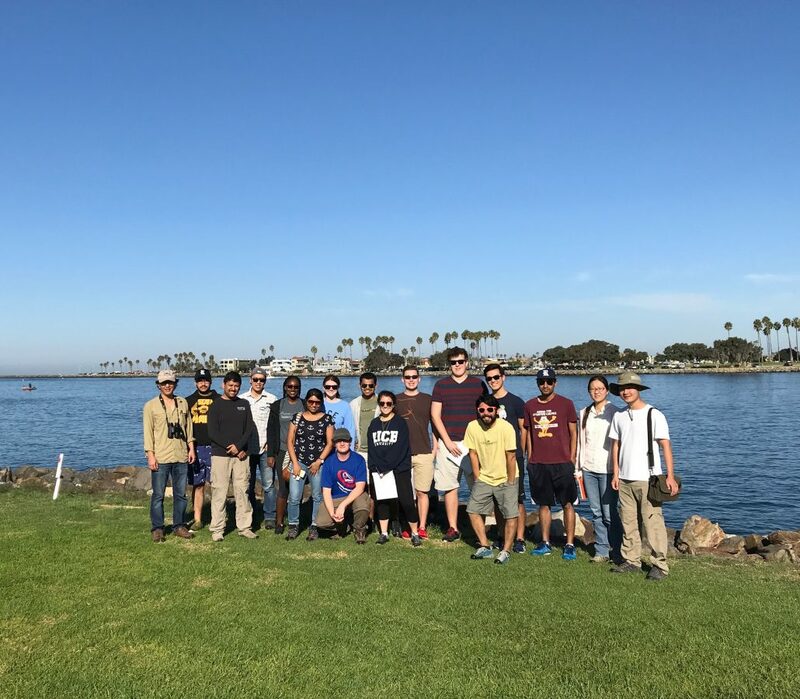 This blog describes the 5-day field trip for the Fall 2017 ESCI 321 and 322 classes to Southern California from October 6 and 10, 2017. 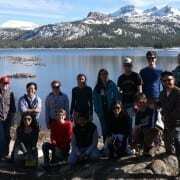 The trip was led by professors Cin-Ty Lee and Rajdeep Dasgupta, and reported by undergraduate students Kendra Baldwin, Kyle Bartsch, Simon Chan, Aitash Deepak, Jennifer Kroeger, Jason Mendez, Jared Nirenberg, Sarah Silberman, and Jackson Stiles. The group was assisted by graduate students James Eguchi, Damanveer Grewal, Hehe Jiang, Sriparna Saha, Chenliang Wu, and Dr. Ming Tang. The Southern California region has a complex geologic past with subduction, rifting and strike-slip motion, occurring along the major plates underlying the North American Continent. Most of California’s Paleozoic geologic history is evident in regions of the Mojave Desert and Death Valley. The Paleozoic era saw deposition of limestones, sandstones, and shales that were later eroded, displaced or uplifted during the tectonic activity that followed in the Mesozoic and Cenozoic. The rocks are primarily limestone with an abundance of fossils that indicate the evolution of early marine life forms. The region saw multiple periods of sea level fluctuation that led to the deposition of carbonate reefs along what is today’s Death Valley. The Mesozoic was a period of increased geologic activity. During the middle to late Jurassic period, the Farallon Plate began subducting beneath the North American Plate, leading to the development of an extensive volcanic-arc system along the western coast of North America, and uplift of the Rocky Mountains in the late Cretaceous. 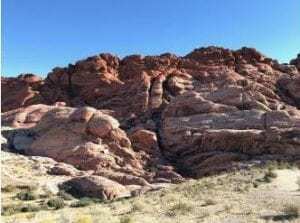 Subduction also led to formation of the Southern California Batholith and other plutonic and extrusive volcanic regions in the Mojave Desert Region. An example of Mesozoic plutonic rocks can be seen in the Joshua Tree National Park, where the extensively exposed rocks exhibit uniformity in texture and grain size. The peak of volcanic activity occurred during the late Cretaceous in the southern Sierra Nevada region. The region was also covered by sedimentary deposits, with uplifting and metamorphism combined to create intertwined sedimentary and volcanic deposits. During the early Paleogene period, while Farallon Plate subduction continued, volcanic activity in the peninsular region ceased. Uplift and erosion rates were continuous, which led to the deposition of vast amounts of sediments along the western continental shelf. Moving into the early Neogene period, the Farallon Plate disappeared into the subduction zone forming the San Andreas Fault; at an angle oblique to the western margin of the continent. 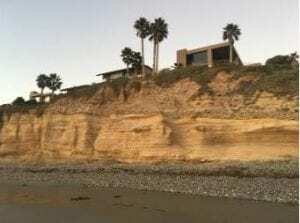 As mountains began to rise along the coastline, marine sedimentary deposits became exposed. Eastward, crustal thinning and tectonic uplift along the Mojave desert region led to the development of the basin and range landscape. Additionally, Baja California started to move westward, away from Mexico. In the quaternary period, the major driver of tectonic activity is the strike-slip San Andreas Fault, resulting in transverse ranges and extensional regions. Modern Rivers flowed through the basins while there was still volcanic activity in the Mojave region. 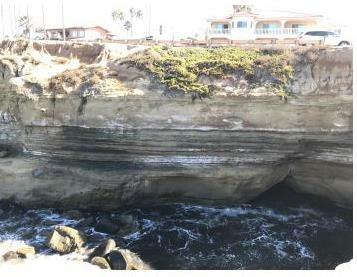 The first stop of our trip was at Tourmaline Beach in La Jolla, California. We looked at the Point Loma Formation, which consists of marine deposits of sandstone and siltstone, formed originally in the Sierra Nevada- Peninsular Ranges batholith during the late Cretaceous. These were eroded from the roof of the magmatic arc that rose quickly due to compression and magmatism. Rapid erosion and transport of the deposits can be implied from the poorly rounded igneous sand grains. The marine deposits of forearc sandstones are tilted; graded-bedding and small areas of soft-sediment deformation are visible here. After a breakfast of bagels we reached an overlook above the San Diego River. The river is slow moving, and while the water level was fairly low when we were there, we could tell that the water level is often much higher. The water here is estuarine and thus brackish, but does not have strong enough sediment discharge rate to create a full delta. The sediment load is mostly comprised of fine sands and silt. Following the San Diego river overlook, we made our way to where the river meets the sea. While the San Diego River has migrated along the coast over time, it is now contained by a jetty, cementing its path to the ocean at one spot. The engineered jetty also prevents beach sediments carried by currents along the shore from piling up in mission bay in favor of generating a large sandbar at the river channel. This piled up sediment is rarely breached by floods and suffers minimal erosion. Sunset Cliffs Next, our group stopped at the cliffs overlooking the Pacific Ocean at Point Loma. These cliffs are an example of late Cretaceous sandstones (75ma) that have a high sand to mud ratio, making them fairly resistant to erosion. These sandstones belong to a forearc setting, exposed due to tectonic uplift, that enabled preservation and exposure of deep water sediments. Finely laminated layers at the bottom of the exposed strata are most likely the result of deposition in a calm depositional environment with high clay content. Overlying the thin laminated layers was a thicker layer of sandstone (indicating a much higher energy environment) and the white markings are erosional surfaces along the cliffs. Within this layer large rip-up mud clasts were deposited. Further up in the outcrop we could see an old soil horizon and erosional unconformity that represents a 70 million year gap between the Cretaceous sediments and the more recently deposited sediments. We also identified sections of soft sediment deformation and local slumping from differential compaction of the overlying layers on the soft sediments. The entire outcrop was interlaced with faults. Our next stop was at the top of the Cabrillo National monument overlooking the San Diego Bay. The bay itself is a graben bound by faults on the west, and the Cretaceous mountains in the East. Coronado Island is a sand spit created by long-shore sediment pulses from the ocean. The sediment deposited on the coastal plains from the eastern mountains is manifest into turbidites and deep water deposits. Outside of San Diego, we parked along the roadside to look at a large outcropping in the Peninsular Ranges batholith region, which is around 90 million years old. At the road cut the majority of the rocks were tonalite (a type of felsic granodiorite mostly made of plagioclase). This tonalitic outcrop was crosscut by large dark colored (mafic) and light colored (silica-rich) dikes. The dikes intruded after the tonalite batholith had formed and the brittle nature of the tonalite led to the development of extensive fractures. Cuyamaca Lake is underlain by Cretaceous gabbro composed mostly of plagioclase and orthopyroxene that are associated with the Cretaceous volcanic arc. Olivine was also present, but it was difficult to identify. The rocks around Lake Cuyamaca are also about 90 million years old, but is unique given it is one of the only sites in all of Southern California with layered gabbro deposits. To reach this location we took a quick hike through the bush. Exposed on the plain beyond were Paleozoic aged sedimentary rocks that had been melted and deformed during the Mesozoic era by through ductile underthrust in a subduction zone. During this process, many felsic (white colored) dikes formed through the rock, cross-cutting each other in several places. Within these dikes, we observed clusters of black coarse-grained tourmaline crystals; these are described as tourmaline pegmatites. Throughout the surface of the exposure, there were small, unnatural depressions which interestingly served as evidence that the outcrop was used by Native Americans to grind nuts. After leaving Julian (without having any of their famous apple pie), we stopped along the side of the road in a vast plain surrounded by mountains. The region showed a high quantity of brittle shear within fault gouges, and ductile shear visible in mylonite metamorphism resulting from high shear strain. Protomylonites from this intense ductile shear were quite prominent. The tonalite in this area was highly foliated, and there were few dikes present. The alluvial fans observed here had a high inclined gradient and contained many boulders and cobbles. The vast plain was actually a large coalescence of alluvial fans known as a bajada. At the next stop, we were greeted by a small shack with the words “dead body inside” crudely painted on it. The stop was located at the base of the mountains near Anzo Borrego, with a view of a range across a playa. The mountains in the distance had reddish black sediment deposits along their hillsides. These were representative of fluvial sediments about 3 to 5 million years. The reddish black coating was likely a layer of iron-manganese oxide around 10 microns thick, and it indicates they were older than the incision. The rocks along the hillside we had stopped at were proto-mylonites. The shear stress during the mylonitization process caused various minerals in the rock to recrystallize that resulted in presence of clusters of garnet crystals forming throughout the matrix. The mylonitization was an inter-arc shear zone and most likely occurred during the late Cretaceous arc magmatism, and suggests a connection between the arc magmatism and a great amount of deformation of the upper plate. Our first stop on the third day was at the Salton Sea Pliocene deposits between the Salton Sea and the Gulf of California Basin. The deposits were fluvial, lake, and deltaic associated with the initiation of the rifting of the Gulf. We saw different surfaces, including tilted mudstones with sandstones on top of them. The canyon had large cobbles around the rim, likely transported there by large floods. Many of these cobbles were mylonites similar the ones we saw at the end of Day Two. Our next stop was at the Salton Sea which is a landlocked water-body, formed as a result of northward extension of the Gulf of California, to accommodate the developing faults in the area. While the base of the Salton Sea is oceanic crust, the water itself is not that deep (~10s of meters). Interestingly, the Salton Sea is about 234 feet below sea level. Over the last 100,000 years or so, the water level has been decreasing continually. The restricted nature of sea lead to conditions with no upwelling, and therefore there is no thermohaline circulation that caused the sea to stratify and there is a good amount of bioactivity in the top layers. Every once in awhile this circulation will start up, and many of the fish die. The sea is now fed by agricultural runoff. Here we had the chance to see what was left of a rhyolitic, Pleistocene lava flow that quenched to obsidian. Rocks layered with obsidian and pumice and xenoliths were interesting features at this outcrop. These features indicate that an initially volatile-rich magma was subjected to decrease in pressure which led to the formation of these layered obsidian-pumice flows. As the volatiles began to escape, the magma was left with little/no gas and it quenched eventually to form glassy obsidian. The escape of bubbles was in fact facilitated by their size. The smaller bubbles that could not escape eventually formed the pumice layers. We also evidence of shearing and slow stirring of the magma at the surface. The rhyolites indicate that this area tends to have a high heat flow and a thin crust. Presence of mud-volcanoes in the area, further establish the dominance of a high geothermal gradient in this area. These mud volcanoes are interesting because they are constantly migrating.The mud-volcano flows are essentially like basaltic lava flows, that flow slowly, traveling over larger distances owing to their low viscosity. The tops of the volcanoes were spurting out mud and bubbling out CO2. At Box Canyon, we observed tilted sandstone layers from the Pliocene with some conglomerates in the layers. 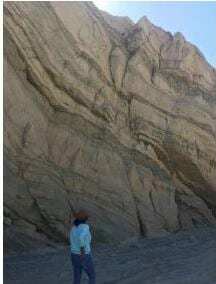 These sandstones were tilted as the Gulf of California subsided during rifting. 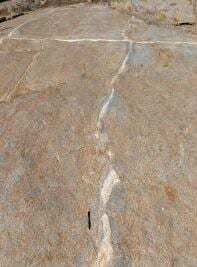 We saw evidence of cross-bedding and several channels indicating that most likely they formed in a braided river system. There was high grain size variability is the sandstones and conglomerates, so the depositional environment was likely close to the source. Also, we noted that gypsum was later precipitated in the fractures in the sandstone after deposition. Rip-up mud clasts were also found in both the sandstone and conglomerate indicating a high energy environment. At Mecca Hills, we stopped on the side of the road to observe a large anticline on the side of one of the hills. The sediment layers were most likely around 3 million years old, while the anticline was due to younger, active tectonics. We stopped along the side of a highway dodging speeding vehicles, to observe the Pelona Schist that formed as part of the accretionary complex as the Farallon plate was subducting during the late Cretaceous period. The schist here underwent greenschist-facies metamorphism as is evidenced by the abundance of chlorite, biotite, and muscovite minerals. The rocks sections were well foliated and weathered on the top. 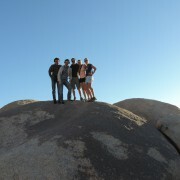 At Joshua Tree National Park, we observed the Jumbo Rocks that are coarse-grained granites formed in the Cretaceous and Jurassic eras. Interestingly, the rocks are extremely homogeneous in composition and grain size without much texture. The rocks are jointed, that likely formed while the pluton was cooling to release stress. The joints were filled by dikes that had a very similar composition to the surrounding rocks, though we observed less biotite in the dikes. These dikes are possibly the remains of the magma that formed the pluton that came back up later to fill the joints after the joints formed during cooling. Palms Canyon Oasis The last stop of the day was at Palms Canyon Oasis, where we observed Jurassic quartz monzonites with grey feldspar megacrysts. Here we observed large, single crystal alkali feldspars that were prominently larger than the surrounding grains. While it is not well-established how these megacrysts form, it has been proposed that fluid transport aided in the growth of these large phases. At this stop, we walked out on evaporite deposits. The evaporites were seemingly most NaCl but presumably had some amount of lithium and calcium chloride as well. The deposition of these evaporites is aided by the topography of the area. The area is a local low: structurally a small graben bounded by faults and mountains on either side drain into it. Water draining from the surrounding mountains enrich the water in minerals that then form evaporite beds as the water accumulates and evaporates in the graben. We also saw several interesting structures in the evaporite deposits including hair like structures formed by wind, beautiful halite crystals, and thin layers of evaporite formed on the surface of bubbles of briny water. At Amboy Crater, we looked at a cinder cone volcano and the associated extensive basalt lava flow. The cinder cone and basalt lava flow formed in the Pleistocene and their young age is reflected by the characteristic shape of the cinder cone as weathering has not changed its form much yet. The extensive basalt flows seen here flowed over much larger areas than the rhyolite flows we previously saw due to the basalt having less silicate in it which lowers the viscosity allowing the lava to flow further. We examined bombs and other debris shot out from the cinder cone during its formation, although we did not actually walk up to the cinder cone itself. The flow and pyroclasts were quite vesiculated and several flow indicators like ridges and folds visible. The cinder cone itself formed as lava was spit out of the vent as opposed to the usual flowing lava that would create other types of volcanoes. 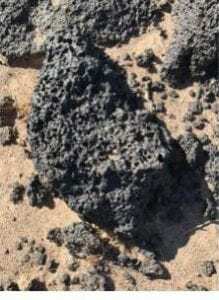 The cinder cone is formed as lava cools quickly after being launched into the air and falls back to the ground creating the characteristic conical shape made up of pyroclastics. Dish Hill was another volcanic cinder cone nearby; however, it was a few million years older. Due to weathering, and from mining for road fill, faces of this cinder cone had been dissected which allowed us to examine the interior structure of a cinder cone. Extensive weathering and oxidation also gave Dish Hill a reddish color rather than Amboy Crater’s black color. At this stop, we saw more bombs and pyroclasts, both of which were larger for the most part. The dissected side of the cinder cone gave us access deeper into the cone where we found many peridotite xenoliths brought up from the mantle. We also saw granitic xenoliths from the crust that were brought up from the walls of the magma chamber and vent. Common in the rocks were olivine and pyroxene xenoliths. The Kelso dunes make up the largest field of windblown (aeolian) sand deposits in the Mojave Desert. The field is still active and includes migrating dunes, vegetation-stabilized dunes, sand sheets, and sand ramps. The grains are light-colored which leads to the conclusion that the protoliths are quartz and feldspar. A closer look at the grains themselves shows that they are fairly round and around 100 microns in the maximum dimension. These sand grains most likely originate from the Mojave River sink (west of the dune’s location). We also observed that the ripples on the dune face indicated wind direction, with the shadowed ripple portions on the lee face towards the wind. The south side of the dunes also held more vegetation than the lee side. This volcanic field is made up of alkali basalt cinder cones and lava flows. These are associated with the development of the Basin and Range. Most of the lavas in this area are younger than one million years. The lack of erosion of the cinder cones and unweathered lava flows show the youth of these volcanoes. The lava tubes present in this field would have formed when a low-viscosity lava flow developed a hard crust (due to cooling of surface lava) that acted as a roof allowing the lava beneath to sustain high temperatures and continue flowing. Within the tube, marks, called flow ledges/lines, on the wall indicate different levels at which the lava flowed. Additionally, lavacicles (stalactites) and drip stalagmites are clearly visible inside of the tube. These could form when lava splashes onto the roof of the tube and slowly oozes down. At this mountain pass, a carbonatite-syenite complex is approximately one billion years old. 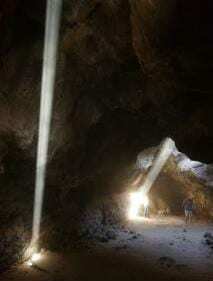 There is a mine nearby that extracts rare-earth elements from the carbonatite. Carbonatites are rare igneous rocks but have three models to explain their formation. Carbonatites are usually associated with undersaturated (low silica) igneous rocks; instead of silica tetrahedra, the anions are carbonate complexes. This rock can form directly by low-degree partial melts in the mantle, and melt differentiation. Another way is through liquid immiscibility between a carbonate melt and a silicate melt. Finally, extreme crystal fractionation may saturate CO2 levels in the magma, leading to the formation of carbonatites. Fun fact! : Mountain Pass used to be the largest rare-earth element mine in the world until China discovered large deposits which can produce up to 105,000 MT of rare earth minerals a year. At this pass, we observed syenite (intrusive plutonic rock) with high amounts of orthoclase, along with minor amounts of hornblende and biotite. The reddish rocks are Jurassic age sandstones that represent fluvial, lacustrine, and Aeolian environments, most likely having formed in a shallow, continental sea. The sandstones are overlain by gray Cambrian limestones. A closer look revealed that below the Jurassic sandstones lay Permian sandstones. These actually formed from large dunes, resulting in cross-cutting beds and dipping in a massive scale. Late Cretaceous-early Tertiary back arc thrusting resulted in an inverted sedimentary sequence where older rocks are underlain by younger rocks during a retro-arc thrust event where the Farallon oceanic plate was being subducted beneath the North American plate.